Birding being a visual and an auditory pursuit, it’s not surprising that publishers have taken advantage of the media of its day to produce bird books accompanied by CDs or DVDs. These allow birders to hear as well as see the birds they are studying. (This concept has been totally transformed into the ‘birding app’, which allows birders to view and hear specific birds from their smart phones or other digital appliances wherever they may be. But, that technology is for another article.) Nobel Proctor, a professor of ornithology and biology at Southern Connecticut State University, and Cool Springs Press, a publisher of “home and garden” books, have produced a new twist on the idea of sight and sound with the publication of North American Songbirds, a celebration of 100 passerines with the added bonus that you can scan a QR code to hear each bird’s song and calls. A QR code, if you’re not familiar with it, is that black square that looks like a tiny piece of computer art. QR stands for Quick Response (the things I learn when I write a book review!). A QR code contains information, and once scanned with a QR code reader, an app you can upload to your smartphone for free, you will be able to read or, in this case, hear the information. I was interested in reviewing this book because, although I had uploaded a QR code app last year, I’ve never used it. It is a very easy process: Find app on phone (I have a lot of apps, so this always takes me a half-minute), implement app, center app square on QR code, tap square. A sound file appears which, once tapped again, produces the song or call of the target bird. The files are comparatively long, about 30-seconds each, but are marred in some cases, by white noise in the background. Comparing these sound files to those of apps on my smartphone (birdJam and BirdTunes), I thought that the app files sounded “cleaner”. The process itself was easier to use than playing a DVD while reading a book. I did have a little trouble keeping the book open while I scanned the code; a spiral binding would have been preferable. 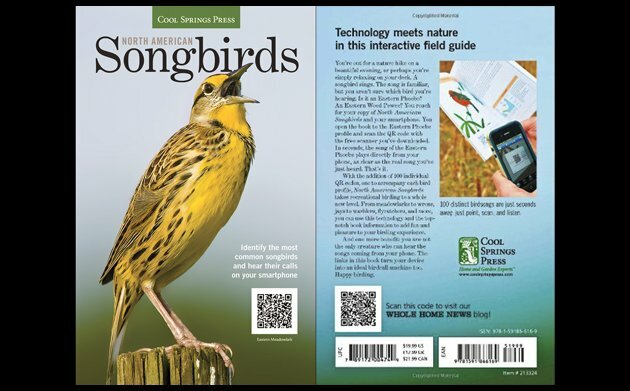 North American Songbirds does include instructions how to use QR codes and directs you to where you can find code readers for different types of smartphones. I think this is a bird song application that works best for readers using the book at home. In the field, birding apps with sound files would be much easier to use—less juggling of book and phone. North American Songbirds is clearly oriented towards beginning or backyard birders. It devotes two pages to each bird, a full-page drawing of the bird on the left, a description of the bird, including singing and nesting behavior, on the right. 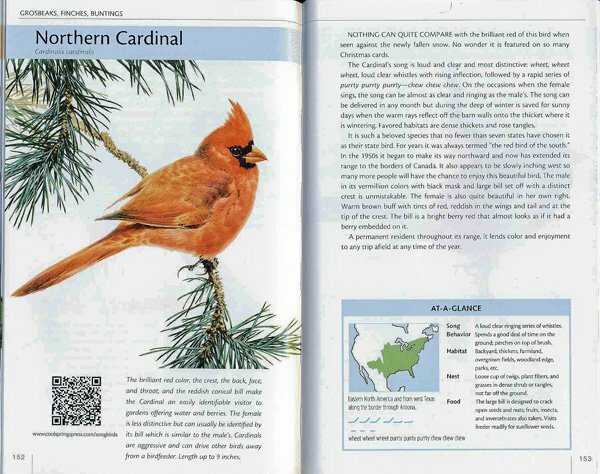 The right-hand page also contains an At-A-Glance box, offering a range map, a diagram of the “rhythmic flow” of the bird’s song, and summary information on what the song sounds like, behavior, habitat, what the nest looks like, and food. I was puzzled by a couple of the birds featured in North American Songbirds; I had never heard of Plain Titmouse nor Water Pipit. A little research revealed that these are old names of birds that have been split into different species. Plain Titmouse became Oak Titmouse and Juniper Titmouse in 1996. Water Pipit is now known as a European species; the American subspecies became the full species American Pipit in 1989. I realized on further examination that many facts and data in this book are out-dated. Scientific names don’t reflect the massive changes to species in the warbler family. Blackpoll Warbler, for example, is listed as Dendroica striata, not Setophaga striata. Tanagers are listed in the table of contents as members of the Tanager, Thraupidae, family, not members of the cardinal and grosbeak, Cardinalidae, family. Range maps don’t reflect the changes of boundaries over the past ten years; for example, you don’t see the northward and westward expansion of the Northern Cardinal. Noble Proctor has written two previous books about 100 songbirds, and I was able to get a hold of the more recent title, The Songbirds Bible: A Visual Directory of 100 of the Most Popular Songbirds in North America (Sellers Publishing, 2006). The text and illustrations for the bird accounts in North American Songbirds are exactly the same as those from the older volume. The drawings are exactly the same. (They are credited in the 2006 volume to David Ord Kerr as “Bird artist”.) The range maps are also exactly the same. The text has been re-organized, but is basically the same. There is some new material in the bird descriptions, generally enhancing the charm of the text rather than adding new information. The introductory text material is also the same, with the more recent title extracting basic information on why, where, and when birds sing. Sadly, the chapters on bird anatomy and bird display from the 2006 title are not included. The illustrations in the Introduction are different. Now, it is not unusual to reprint material from an earlier book. Second and third editions of many bird identification guides do this, and in the best books the authors tell you what they have added, withdrawn, and changed. (A good example is the second edition of Hawks in Flight by Pete Dunne, Clay Sutton and David Sibley.) I do have a problem with books that re-cycle material under a different title and that don’t tell you that they are doing this. And, I cannot recommend a book with outdated information. This is not fair to the reader. It is especially unfair to beginning birders. My nightmare is that some newbie birder will read this book and then go out birding, point to a brown, streaky bird on a lakeshore, and call it a Water Pipit. We all know what that can feel like. Yes, I know that this is not the worst thing in the world, but it is small incidents like this that can discourage people from becoming members of our tribe. I do hope that Noble Proctor and Cool Springs Press will re-visit this book and update it with 2014 taxonomy, species names, and distribution. Current information would make this book a good first-step for people interested in birds but intimidated by field guides. As I said above, the text is charming and accessible, reflecting a deep passion for birds and for bird observation. The QR technology may also intimate some would-be birders, but the real obstacle here is something old-fashioned but essential–updating the knowledge base. Cool Springs Press, March 2014, 224 pages, 8.2 x 5.1 x 0.6 inches.